The myth of human rights playing a decisive role in the diplomacy of the United States is an important façade to be broken before touching the current political crisis in Venezuela. A noble crusade for democracy and promotion of human rights are applied by the State Department only in times when these enlightening qualities serve the interests of Washington. Thus, the regime change is conveyed to the public as liberal intervention, while the predominantly authoritarian outcomes of such liberal interventions are rarely discussed in the corporate press. This goes without plunging deep into describing the Western protectionism of the most repressive regimes in Saudi Arabia, Qatar, Afghanistan, Egypt and Turkmenistan. The corporate media in the West is embedded with these political ventures. This means an overwhelmingly unfavorable coverage of certain governments is present only in times when there is a political agenda of suppressing or removing such regimes. A striking example has been Syria where the corporate press is actively involved in covering the conflict. That coverage overwhelmingly stands hostile to the Syrian government, echoing the U.S’s openly stated interest of seeing the downfall of Assad. On other side, there is coverage or the absence of it on Yemen. For over 2 years, the Saudi-led and American-supported destruction of this country of 28 million had virtually gone unnoticed. Perhaps, the world’s worst cholera outbreak and the world’s worst humanitarian disaster don’t worth the news. Yet, there is news, constant news, covering the political crisis in Venezuela. 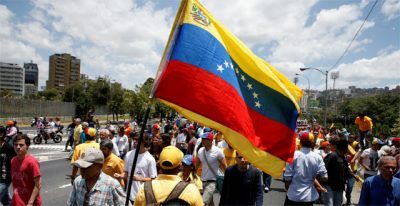 Daily reports are published on the corporate outlets reverberating the soaring crime, food shortages and poverty experienced by millions of ordinary Venezuelans. If considering their perspective a valid fact, Venezuela has been a failed state for over 2 years, with editorialists anxiously waiting for a final default. An overwhelming blame for the validly existing economic crisis was attributed to the socialist policies of Nicolás Maduro’s government, with Forbes arrogantly celebrating the setbacks of Bolivarian Revolution. Certainly, there are failures for which the government is responsible. However, the fundamental factors influencing the crisis had virtually been ignored. The slump in oil prices and an outright economic war being fought against Venezuela, are out of discussion. The overthrow of a socialist government is. For over 3 months, Venezuela had experienced violent protests from the opposition forces who are calling for ‘that’ overthrow. Daily clashes are occurring between the security forces and protesters. At least 87 deaths had so far been attributed to the violence. Venezuelan fractured opposition to the ruling socialist government is politically right-wing, supported by local elites who lobby for the exercise of neoliberal capitalist policies, practiced by many regional oligarchic allies of the United States. An independent investigative journalist, Abby Martin, was on the ground covering the demonstrations. Her report contradicts the mainstream portrayal of these protests. While the majority of anti-government demonstrators are peaceful, a small contingent of masked radicals is used on the “front lines” to clash with security forces. These provocateurs; sometimes outright fascists, are the most effective elements whose actions intend to provoke the international response. And the response is coming. The government is now being charged with repression of the opposition protests. Barely any attention is taken on the opposition violence. Breakdown of the death toll is not reported, with all deaths automatically being blamed on the security forces. Yet, such data exists. The South American-based TeleSUR published a report with names of individuals who lost their lives in the crisis. Only 6 deaths are blamed on the security forces. The rest were killed in shootings, looting and lynching, exercised by the opposition mob. Other figures estimate the security forces to be responsible for over a dozen deaths. Crowdfunding is described to be the key driving force of resistance. Small donations do contribute to the ongoing crisis in Venezuela. There are many campaign pages on GoFundMe and Generosity raising funds for the radicals in masks. In my search for such fundraisers, I found 17 pages, (15 on GoFundMe and 2 on Generosity), specifically raising money for the protests. At the time of writing this article, the combined sum raised on these campaigns tops $102,584. The most successful fundraiser on Generosity raised $44,768 in small donations. The opening dates of these campaigns correlate with the period of current unrest in Venezuela. Beneficiaries of these funds will perhaps be the most radical elements on the ground, those who intend to provoke the international response. Undoubtedly, crowdfunding provides just a small fraction of the money used to sponsor opposition. 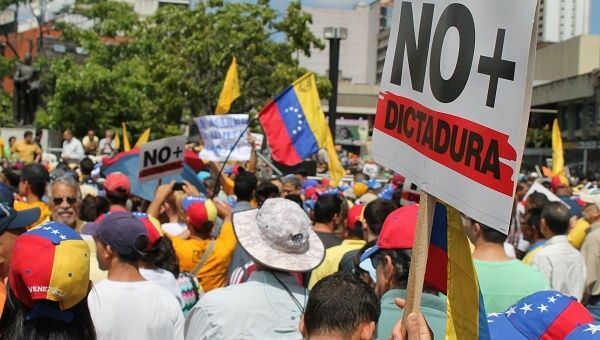 The most recent bill in Congress aims to provide Venezuela $9,500,000 on democracy promoting activities. Value of this sum would increase astronomically on the Venezuelan black market exchange. Ones again, the regime change agenda is painted with “democracy promotion” and human rights. That “democracy promotion” also involves sanctions. It was the Obama administration who first imposed them on Venezuelan officials back in 2014. A year later, the non-militaristic republic was declared a threat to national security of the United States. 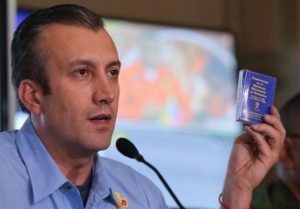 Today, a list of sanctioned individuals includes 8 members of Venezuelan Supreme Court and top government officials, including the Vice President Tareck El Aissami, who was labeled a drug “kingpin” by Washington. If drug “kingpin” was the motive for sanctions on the Vice President, then a large circle of politicians and oligarchs in Mexico should long be veiled under similar restrictions. But Mexico is portrayed to us as a democracy while Venezuela is an authoritarian regime, requiring a package of democracy promoting measures. Tough economic sanctions against Venezuela were also debated in Washington. If imposed, they will only exacerbate the already difficult situation facing millions of ordinary citizens. Even before the economic crisis, before the scarcity of basic goods and manipulative use of currency devaluation, attempts were made to topple the socialist government from powers. Back in 2002, the Venezuelan elites had colluded with Washington to orchestrate a coup against the predecessor of Nicolás Maduro, the symbolic leader of Bolivarian Revolution, Hugo Chavez. They failed… The power of ordinary citizens had restored the democratically elected leadership. The Empire and its multinational corporations maintain a strong interest in Venezuela’s vast oil reserves, numerically the largest in the world. For them, the biggest crime committed by the government was the use of oil revenues for empowerment of ordinary citizens, the people who were forgotten and neglected by previous administrations. Reinforcing political influence over the government and privatizing control over the oil sector became an obsession. So far, it seems the elites and Washington are prepared to use any diplomatic and economic means to achieve the outlined goals. Thus, there is no end in sight to protests. Meanwhile, the ordinary Venezuelans face a tough road ahead. “I always say we don’t want to be rich, our aim is not material wealth. It is to live with dignity”, emphasized Hugo Chavez in an interview with a renowned filmmaker and investigative journalist, John Pilger. The struggle to “live with dignity” continues for Venezuelans, similarly as it continues for the billions of people across the world. It is not for the corporate Empire to decide on the lives of ordinary people and the expropriation of natural wealth their lands preserve. It is cannibalistic to use starvation as a weapon, forcing people submit to the cynically imposed ultimatums.